A spokesman for former President George H.W. Bush says it will be the first time since 1976 that he won't attend the Republican Party gathering. HOUSTON — A spokesman says former President George H.W. Bush and his wife, former first lady Barbara Bush, will skip the Republican National Convention next month in Tampa, Fla., because of health reasons. The spokesman, Jim McGrath, says it will be the first time since 1976, when Bush was director of the CIA and refrained from partisan activities, that he won’t attend the Republican Party gathering. 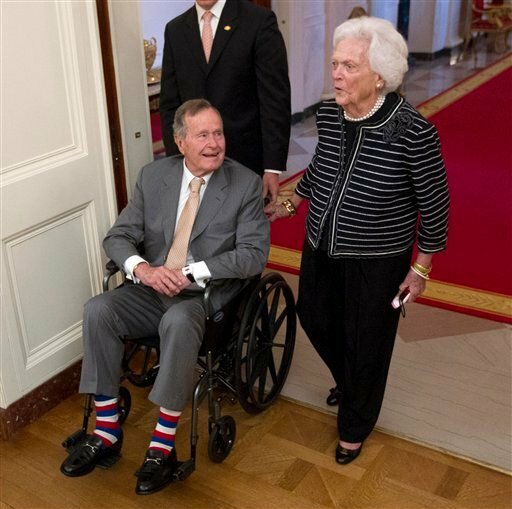 The 88-year-old Bush has a form of Parkinson’s disease that afflicts his legs. He now gets around using a wheelchair or motorized scooter. McGrath said today that the situation surrounding Bush’s mobility will keep the couple from attending the late August convention. The former president described his condition to Parade Magazine for an article published this past weekend. “They call it vascular Parkinsonism. It just affects the legs. It’s not painful. You tell your legs to move, and they don’t move. It’s stranger, but if you have to have some bad-sounding disease, this is a good one to get,” he said. Bush and his wife have endorsed Mitt Romney, the expected GOP presidential nominee. But Bush’s son, Jeb, the former Florida governor, has been critical of the Republican party. Last month, Jeb Bush said Ronald Reagan and his father would have a hard time getting elected by today’s Republicans. “Reagan would have, based on his record of finding accommodation, finding some degree of common ground, as would my dad, they would have a hard time if you define the Republican party, and I don’t, as having an orthodoxy that doesn’t allow for disagreement, doesn’t allow for finding some common ground,” Bush said. Nonetheless, Jeb will be at the convention, according to his spokeswoman. He’s also headlining a fundraiser for Romney today in Indiana.